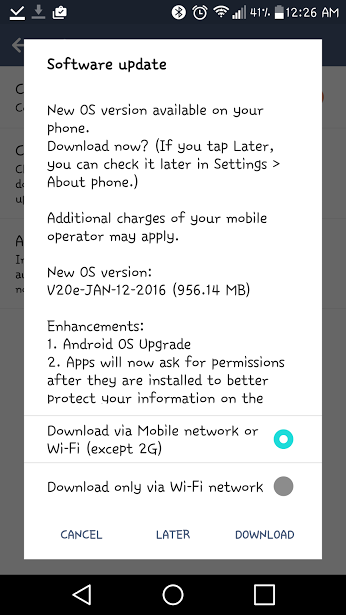 So the other day we reported that Rogers was stating they'll send out their OTA for the LG G4 on Feb 3. Well, looks like the ground hog popped his head out and said you needn't wait as some folks, like +Chris Pollard, are getting the update now. The update will be a wopping 1GB file. Hrmm... I don't have WiFi at work... should I burn up a third of my data plan for the update? Looks like some of you will get this update early and enjoy the marshallowey goodness before the rest. I'm looking forward to having Doze get my battery to last even longer, or using Google Now on Tap. Awesome!